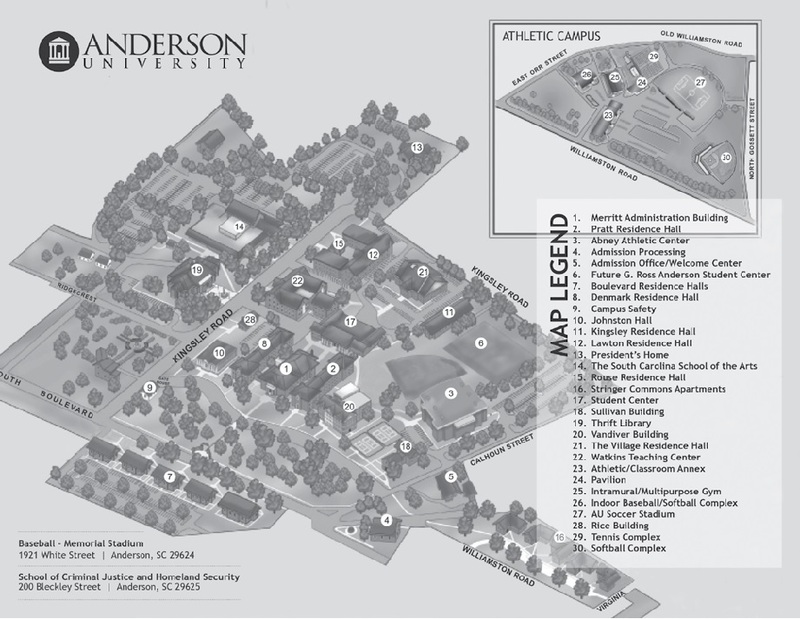 In keeping with its Christian mission and grounding in the traditions of the liberal arts, Anderson University is dedicated to the development of the intellect and offers an integrated core curriculum based on clear, assessable common learning goals. These essential goals prepare all undergraduate students, regardless of major, to communicate clearly, think critically, serve ethically, and solve problems creatively as they become responsible family and community members, successful employees, and global citizens and stewards in the 21st century. It is the aim of Anderson University to develop and nurture responsible, confident, independent servant-leaders with a foundational love for life-long learning and a commitment to Christian virtues and the betterment of society. It is important to reference the degree requirements for a specific academic program as University Core requirements may differ depending on degree and major. FYE 103 - Foundational Year Experience 2 Cr. Hrs. * MAT 104 - Math for the Liberal Arts 3 Cr. Hrs. MAT 105 - College Algebra 3 Cr. Hrs. MAT 113 - Calculus Concepts 1: An Intuitive Approach to Differential Calculus 3 Cr. Hrs. MAT 114 - Calculus Concepts 2: Intuitive Approach to Integral and Multivariate Calculus 3 Cr. Hrs. MAT 130 - Precalculus 3 Cr. Hrs. CDG 111 - Coding 1 3 Cr. Hrs. HIS 121 - Historical Perspectives: Topic 3 Cr. Hrs. HIS 161 - United States History 1 3 Cr. Hrs. HIS 162 - United States History 2 3 Cr. Hrs. HIS 181 - Foundations of the Modern World 3 Cr. Hrs. HIS 182 - The Modern World 3 Cr. Hrs. ECO 200 - Economic Concepts 3 Cr. Hrs. KIN 138 - Personal Fitness and Wellness 3 Cr. Hrs. AST 104 - Inquiry in Astronomy 4 Cr. Hrs. BIO 104 - Inquiry in Environmental Science 4 Cr. Hrs. BIO 150 - Human Biology 4 Cr. Hrs. CHE 104 - Inquiry in Chemistry 4 Cr. Hrs. SCI 104 - Inquiry in the Sciences 4 Cr. Hrs. ART 110 - Creative and Critical Thinking through Visual Art 3 Cr. Hrs. ART 210 - Studio Art for the Non-Major 3 Cr. Hrs. MUH 110 - Music Appreciation 3 Cr. Hrs. THE 103 - Acting for Non-Majors 3 Cr. Hrs. THE 110 - Theatre Appreciation 3 Cr. Hrs. Must take three credit hours to fulfill the Creative Inquiry requirement. Audition required. MUP 122(1-8) - Anderson University Wind Symphony 1 Cr. Hrs. MUP 123(1-8) - Instrumental Chamber Ensemble 1 Cr. Hrs. MUP 125(1-8) - Anderson Symphony Orchestra 1 Cr. Hrs. MUP 126(1-8) - AU Ensemble 1 Cr. Hrs. MUP 128(1-8) - Guitar Ensemble 1 Cr. Hrs. MUP 129(1-8) - Jazz Ensemble 1 Cr. Hrs. MUP 130(1-8) - String Ensemble 1 Cr. Hrs. MUP 131(1-8) - String Quartet 1 Cr. Hrs. MUP 132(1-8) - Brass Ensemble 1 Cr. Hrs. MUP 133(1-8) - Flute Ensemble 1 Cr. Hrs. MUP 134(1-8) - Percussion Ensemble 1 Cr. Hrs. MUP 135(1-8) - Saxophone Ensemble 1 Cr. Hrs. MUP 136(1-8) - Woodwind Ensemble 1 Cr. Hrs. MUP 140(1-8) - West African Ensemble 1 Cr. Hrs. MUP 141(1-8) - Worship Ensemble 1 Cr. Hrs. MUP 142(1-8) - Country Music Ensemble 1 Cr. Hrs. MUP 143(1-8) - Pep Band 1 Cr. Hrs. MUP 150(1-8) - AUthenticity 1 Cr. Hrs. ASL 111 - American Sign Language I 3 Cr. Hrs. ASL 112 - American Sign Language II 3 Cr. Hrs. IS 398 - AU Abroad 3 Cr. Hrs.